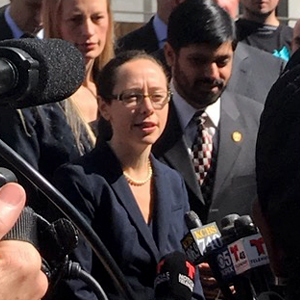 Deputy City Attorney Mollie Lee answering press questions outside court after the April 14, 2017 hearing on San Francisco’s motion for a preliminary injunction in the city’s lawsuit against President Donald Trump’s executive order on sanctuary cities. “President Trump tried to take a scorched-earth approach to immigration, and San Francisco stood up to him. “Because San Francisco faced down this bully, and because others like Santa Clara County joined us, President Trump had to back down. “The Trump administration tried to hold a gun to the head of local governments across this country saying, ‘We’re going to pull the trigger unless you break the law.’ San Francisco is not going to lock people up illegally, even at the federal government’s direction. “Today the president’s lawyer had to acknowledge in court that local governments cannot be forced to comply with federal immigration requests to hold people in jail past their release date. “The president’s lawyer also was forced to admit that only a tiny fraction of federal grants can potentially be withheld from local governments under the president’s executive order on sanctuary cities. “Unfortunately with the Trump administration, federal lawyers have repeatedly said one thing in court while the attorney general and the president say something else in public. That’s why we need a court order to protect San Francisco and every other sanctuary jurisdiction. “Because we faced down this bully in court, the Trump administration’s lawyers had to back down on threatening to strip all federal funding from sanctuary jurisdictions. Herrera sued the president on Jan. 31, 2017 over Trump’s unconstitutional executive order on sanctuary cities. In today’s motion, San Francisco is seeking a nationwide prohibition on the Trump administration enforcing the section of the executive order that allows the federal government to withhold funding from “sanctuary jurisdictions.” Alternatively, Herrera is asking the court to find that San Francisco complies with the law that the executive order relies on, 8 U.S.C 1373, and could not have federal funds stripped from it on that basis. The court heard arguments in both San Francisco’s motion and a similar motion brought by Santa Clara County in a separate case. The court is expected to issue a written ruling in the future.